Hey race fans. The 2014 running season has been very successful for the Everybody’s Hungry Racing Team and we want to share a race recap. Half of the motivation for a great foot race these days is knowing that special groups are benefitting from participants’ joy of running and the entry fees of each race. The Hope 4 Kid’s event is no exception. The race, sponsored by Living Oaks Community Church, Ventura County Human Services Agency and other community partners, is a fundraiser and way to showcase the joy and benefit of adoption and foster care of children in need of homes and families. Monies raised from the event go directly to assisting foster youth in paying for extracurricular activities such as sports equipment, camps, musical instruments, arts, driver’s education courses and more. The course ended up being a fun loop out and around Cal Lutheran, with a great post-race festival full of activities for kids and adults alike. A few members of the Everybody’s Hungry Racing Team came away with placements on the podium as well, followed by group photos and a much needed lunch at Draughts. and each racing team shirt sold benefits FOOD Share of Ventura County. 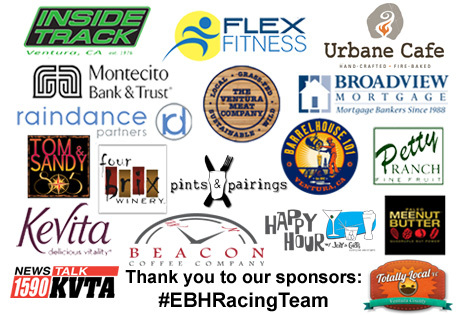 Gallery | This entry was posted in EBH Racing and tagged 10k Run, 2014 Running, EBH Racing Team, Hope4Kids, Running. Bookmark the permalink.